Pitta is one of the three doshas that make up our body and is made up of water and fire elements. 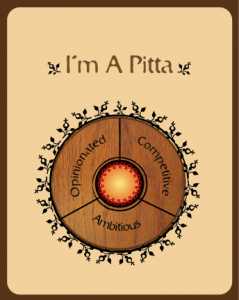 Listed below are the characteristics of a person with Pitta constitution or Prakriti which is when Pitta is predominant in a person. A person with pitta constitution has fair, glowing skin, with freckles and is prone to sunburn. Their hair has a reddish hue and thinning of the hair is a major problem. They have a medium build. They are very good at debates. They have a sharp intellect, focused and are very precise. They have a keen sense of observation, and comprehension. There’s a natural tendency to gain weight but luckily it is also lost quickly. They are prone to acidity, and other digestive disorders. Food to eat- ghee, milk, dal, sweets ,olive oil, sunflower oil, sweet potatoes, leafy vegetables, okra, cinnamon, coriander, cumin . Food to avoid- oily, spicy, chillies, fried, onion, radish, grapefruit, papaya, pineapples etc.